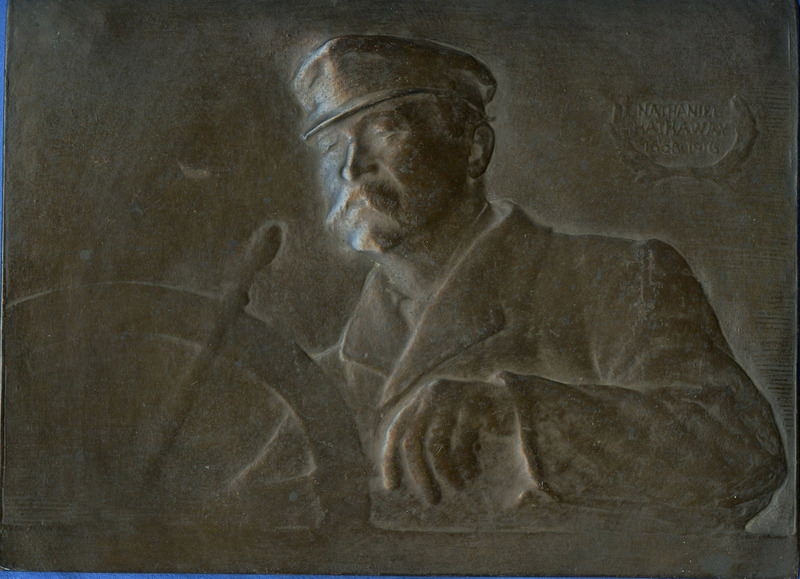 Squinting into the fog at the wheel of his boat, Nathaniel Hathaway (1858-1916) peers forward, intent on guiding his craft to its destination. His big hand holds a handle of his wooden spoke wheel as he leans toward his right, his large frame bent to the task. The strength of his character shows in the look on his face; the strength of his physical body shows in the volume of the square head, thick neck and broad shoulders. Realistic details give him personality. Look at the shape of his cap, the bushy mustache and the cleft chin. He is a handsome man. His advancing age is suggested in the wrinkles around his eyes and the slightly sagging skin beneath his chin. Allen has captured a moment in the life of Nathaniel Hathaway and said something about who he was as a man. Nathaniel’s family were wealthy, powerful and respected citizens, China trade merchants and businessmen in New Bedford. He was the grandson of Nathaniel Hathaway and Anna Shoemaker, Quakers and Abolitionists who were active in the Underground Railway both there and in Philadelphia. The extended family owned a home in Germantown, PA where the first petition against slavery was written in 1688, where they had roots and where Nathaniel’s wife Eliza Gardner Vandervere died. The graves of Nathaniel and Eliza were found in Cutchogue Long Island where their forebears had sought refuge from religious persecution in Holland. Only close study turning it in the light reveals the incredible amount of detail present in relief that is in some places only a faint line in the original clay with no elevation at all. Augustus Saint-Gaudens, in the generation of sculptors before Allen, and perhaps the most significant master and innovator of bas-relief technique, said that the lowest relief he was ever able to accomplish was 1/8”. (S.N.Carter in the Art Journal, see St.Gaudens collection of essays p.61-2) “St.Gauden’s profound contribution to relief sculpture was evident in the work of his students and admirers, prompting further experimentation and refinement.” (Thayer Tolles from Heilbrunn Timeline essays) Allen was one of those in his legacy, assisting Bela L.Pratt who was assistant to St. Gaudens. So he experimented with low relief executing details that created dimension and texture successfully in less than 1/8” of depth. Look at the details in the skipper’s yacht cap and you can see the soft construction of the crown over the hard head strap, the small bill and the suggestion of the patch of a front emblem holding up the center front above the decorative band that buttons at the temples. Faint horizontal lines suggest a decorative braid trim. Below the temples the short hair is ruffled by the wind and a wisp of it is lifted above and behind the ear in a naturalistic style. Individual hairs can be seen in the mustache. The ear itself and the fine nose are carefully modeled. Light bounces off the planes of the head and neck in contrast to the richness of the details found in the face. The coat with its thick lapels and top-stitched edge drawn up tight is open at the neck enough to see the edge of the collar buttoned close above what could be the front of a sweater. The fabric on the forward arm is softly wrinkled at the lifted elbow. Compositionally, this little relief is interesting. Elizabeth McLean-Smith, in her written portrait of her teacher quotes him saying, “’A sculptor must constantly think in three dimensions, not just of one view or in one plane. Actually the sculptor’s most difficult task is not the modeling or the brute label it involves but is in designing the composition.’” She was taught that “every possible view must be considered and given character and structure.” So he established depth by using perspective. The forward arm is large in proportion to the head, which is farther away. The modeling on the edge of the sleeve is done so it looks as if you could see inside it, the details of the sewn construction on the edges and seams catching light and the hollow of the sleeve dark and without detail. The elbow lifts up above the base and looks as if it were protruding over it by blurring the solid edge under it. Balancing the details on the right of the relief is the open space that fills the left side. A diagonal line moves from the elbow in the lower right corner up through the leaning frame of the body through the light-catching chin and disappears into the upper left corner. The arc of the partial ships wheel fills the lower left corner with the spokes of the wheel and the right arm and left lapel creating diagonals in the other direction. The whole composition is grounded by the solids of the horizontal planes of the narrow base and left forearm. The detailed head is centered in the upper half with importance. In his diary, Allen notes on May 14, 1918 on a trip to Philadelphia, that he “Went to Hathaways and had photos taken of children on Friday.” He further notes in his November 15th entry, that he started working on the Hathaway relief. The children were Hathaway’s grandchildren. His daughter Sylvia had married Attorney Harold Evans and had four children, the two youngest of whom were portrayed in a charming double relief. The other daughter, Susan Shoemaker, named after her grandmother, Anna Shoemaker, married Edward D. Thurston. The portrait of their baby boy at the age of one before his untimely death at the age of three was done by Allen. Another female relief found in this group may be Susan. No photographs of this family have been found in the historical organizations of New Bedford, MA, Cutchogue, NY, or Germantown, PA.
Allen was creating many bas-reliefs that year which included the double portrait of Hathaway’s granddaughters, one of his wife in profile, one of a daughter and one of his grandson. Compare the reliefs of Hovey, Etheldreda, Clark, Shuman and the Art Student, all done in the same year. Portraits were the lifeblood of a sculptor, but more importantly, this represents Allen’s experimentation and growing mastery over a very difficult art form. Possession transferred to Agnes’ granddaughter, Christina, in the summer of 2010.